Crops are great this year, all over! Watermelons are one of the easiest fruit to prepare and serve. There's no peeling, pitting, coring or cutting. Just slice, bite, and spit! Select plump, full watermelons with a yellowish cast to the spot that rests on the ground and a dried stem. A hollow thud sound when gently rapped also helps! Keep in mind that watermelons vary in density and moisture content, so these ranges are approximates. A normal batch of 10 eight-ounce jars watermelon jelly requires 6 cups of watermelon flesh, minus seeds and rinds. But the rinds can be used to make pickled watermelon rinds, so there is no waste. Especially if your children have fun spitting the seeds at each other, too! Once picked, put the watermelons in a cool, dry area out of direct sunlight. 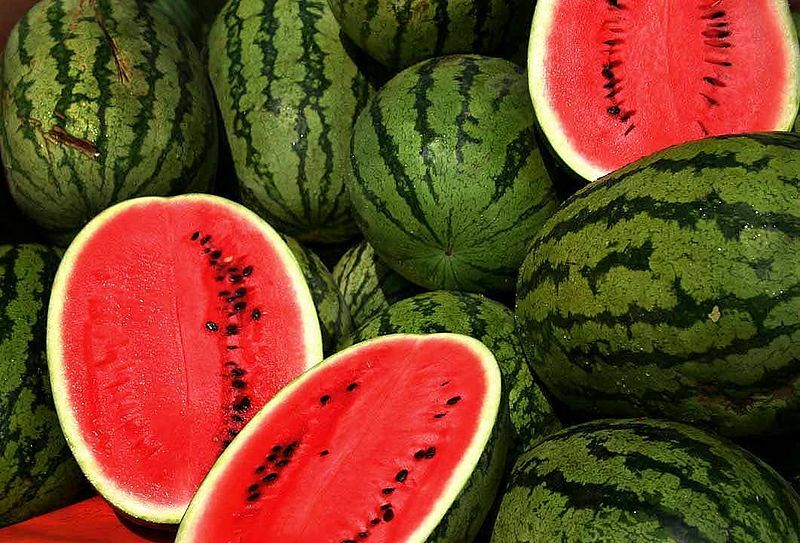 Nutrition and miscellaneous facts: A watermelon contains about 6% sugar and 91% water by weight. As with many other fruits, it is a source of vitamin C. The amino-acid citrulline was first extracted from watermelon and analyzed. Watermelon rinds, usually a light green or white color, are also edible and contain many hidden nutrients but most people avoid eating them due to their unappealing flavor; except when pickled (pickled watermelon rinds are sweet and delicious!. See this page for the easy recipe). They are sometimes used as a vegetable, such as in China, where they are stir-fried, stewed or more often pickled. When stir-fried, the skin and fruit is removed, and the rind is cooked with olive oil, garlic, chili peppers, scallions, sugar and rum. Watermelon juice can be made into wine and into a delicious jelly - see this page for the easy watermelon jelly recipe. Watermelon is mildly diuretic and contains large amounts of carotenoids. Watermelon with red flesh is a significant source of lycopene. Preliminary research indicates the consumption of watermelon may have antihypertensive effects. Click here for the watermelon festivals page.